It is with sadness the family of Carman J. Kelly announce his passing on Friday April 5, 2019 at the age of 85. Born in Fredericton, he was the son of the late Burton and Evelyn (Goodine) Kelly. Carman loved the outdoors, spending 30 plus years as a hunting guide. He enjoyed hunting, feeding the deer and was always up for a good joke. He was loved by all his family and friends and he doted on the cat shadow. He will be deeply missed by his daughter; Tamera Kelly, niece; Nancy Kelly. He was predeceased by his wife LaVerne (Johnson) Kelly, brother Allan Kelly. There will be no visitation or service by request. 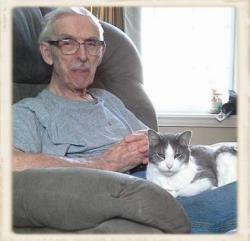 Donation’s in memory of Carman may be made to the Fredericton SPCA.